Before I get back to updating everyone on the recent happenings at Outskirts Press (Facebook Achievements, Book Your Trip to Hollywood options, the 2011 Outskirts Press Best Book of the Year contenders and winner, our new full-color illustrations, etc. 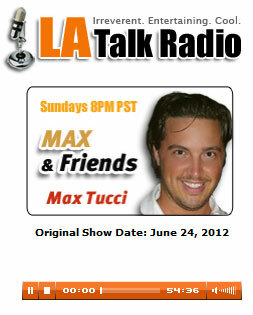 ), I wanted to provide a link to my recent appearance on LA Talk Radio, where Max Tucci (of Max & Friends) interviews me about self-publishing. I even got a chance to put out some props to our Best Book of the Year winners (Doris from 2010 and Susan from 2011), which I always enjoy doing when possible.